Counting last hours before Halloween, a beloved youth’s celebration, we decided to offer you Top 10 movies which are appropriate on this occasion. This Top list is for those, who will decide to spend Halloween night shuddering and trembling themselves under the wraps, when looking at TV screens at home. Although Halloween is associated with such movie legends as “Halloween” or “A Nightmare on Elm Street”, this time we present “hotter” horror movies, which may have been slipped through your eyes or suddenly forgotten. So, with shaking hands, legs and hearts we present a Top list, which is going to transform your Halloween night into a long and endless nightmare. What could better reflect the Halloween spirit than zombies and apocalypse? This debutant work, made by Zack Snyder, the director of the movie, is a conversion of a movie made in 1978. 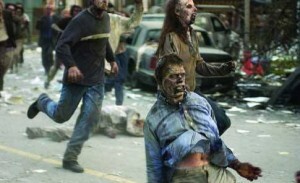 The main idea of a movie – a small group tries to survive in a supermarket, surrounded by zombies. Everything starts, when a nurse Anna comes back home after a shift. She and her husband ignore warning messages, which are transmitted by TV, because they are making love in a shower. Next morning, when their neighbour Vivian comes to their bedroom and bites Anna’s husband leaving a huge wound, Anna realizes that her head is full of questions. Later the movie is full of challenges, horrors, fears and experiences. The movie reaped huge commercial success and critics’ regard. One of them claims: ”This is a cruel and to everybody’s astonishment great conversion of George Romero movie, which perfectly presents an old story with new and original elements. “ In “Bloody Disgusting”, a portal of horror movies, “Dawn of the Dead” was included in the most horrible movies Top 20 over a decade. Claustrophobia and monsters – horror and shock therapy is guaranteed. Men often joke that you have to go out as fast as you can, when wife’s friends gather together, because something unpleasant can happen. This time everything happens similarly. Six friends, who have a strong desire for adrenalin and want to get rid of their problems, take a cave “diving “ journey, where they expect to war down the underworld. From the very beginning we can feel that something bad is going to happen. When ladies get stuck on a cave, we cannot breathe freely, because after some time it turns out that it was not their biggest problem. The movie is accompanied by tension, dark and dirt. Ladies are keeping deep secrets, which add savour to this movie. The end of a movie is as unpredictable as it is the beginning. This movie is not of those full of disgusting horror. This is one of those, which remembers that there is no need to interfere in things, which are not your business. When five friends come to camp in the cabin, located in the woods, strange things start to happen. You believe that you know what happens next? If you say yes, you are wrong, because “The Cabin in the Woods” is different from other horror movies, which you have seen before. It represents the satirical point of view to a well-established former of horror movie and reveals boring horror movies’ formats. Is it scary? Yes and no. First of all, it corresponds to all horror movies’ standards, which are tension, cruelty, shock and so on and so forth. Secondly, this movie reveals something more, because it is a movie about horror movies. Does it look like madness? See this movie and you will be persuaded; after all, you can do anything you want during the Halloween night. A house having a painful story, spirits and mysterious things. “The Conjuring” is exactly about it. James Wan, the director of such outstanding horror movies like “Saw” and “Insidious” presents one more horror movie “The Conjuring”. This movie is about Ed (Patrick Wilson) and Lorraine (Vera Faminga) Warren, two investigators of paranormal activities, who face the toughest case of possessed house, belonging to Perron’s. It is an involving and exciting presentation on an old idea. The movie is filmed perfectly while the sound track gives the shudders from the first accords. The movie is full of fear and jumps, but the story itself is presented and elaborated perfectly. Every character is original, every scene is thought-out brilliantly. It is like a new version of “Poltergeist”, which is certainly not boring. This movie is the second work of Rob Zombie, the performer of hard rock, which is full of bugaboos and horror. “The Devil’s Rejects” is the follow-up of the movie “House of 1000 Corpses”. We chose the second part, because the first one was not successful and attractive. “The Devil’s Rejection” is a story about a group of three people, who are hiding from police officers. This movie is full of blood, muck and horror; therefore it can have a negative effect on those, who does not have iron nerves. Although the movie was not loud in everyone’s praises, it really reflects the Halloween spirit, where ugliness is the most important criterion. Stephen King expressed his opinion about this movie: “Even though this movie does not have any social value, it is a great picture of 70s with tasteless shining. Probably it is something, what Quentin Tarantino wanted to show, when was creating stupid scenes of a movie “Kill Bill””. Many of us would agree that mother is a symbol of softness and love, but you cannot choose, who will be your mother, even if she is not what you have expected. Andrés Muschietti is an unknown director, whose movies were not shown in cinemas till now. Guillermo del Toro, a well-known movie grand, gave him a chance to make a shocking movie, which was positively appreciated by critics. The movie is about two girls, five years living in a deserted cabin in the woods with someone, who they are calling as “Mother”. This movie presents the different point of view of relationship between a mother and a daughter. It is like a creepy ride with rollercoaster and really helps to keep tension during the entire movie. The movie “Mama” gives an opportunity to see all elements, which can be seen in horror movies – dark corridors, monsters, strange shadows and unexpected situations. Therefore this horror movie is modern and not boring. The scenario of a movie will not be a surprise for you, but you will definitely feel shudders on your skin. Do you imagine Halloween without trick or treat? Especially, when the movie is crowned with horror and nightmare. “Trick r’ treat” is directed by Michael Dougherty, who deserved to be called as a modern Halloween King. As you have already realized, this movie is just about this celebration, which is the main reason, why we made this Top movies list. The movie is made of four different scary stories. The only feature, which relates all these stories, is Sam. He is a mysterious character dressed in orange pyjamas and having a potato sack on his head. Sam visits those, who break with Halloween traditions. Even though the genre of this movie is a horror comedy, it really conveys the Halloween spirit and frightens the viewer. These bloody stories will not leave uninterested persons. Everyone gets a scare, when hears strange sounds at night or at the moment the picture at home falls down, but did you ever imagine that maybe you are not alone in your own house? “Paranormal Activity” made an unexpected push into a movie world, but very quickly horror movies’ fans were enthralled. The movie is filmed using the same technique, which was applied when making “The Blair Witch Project”. The creators tell a story about a young couple, who noticed that something strange is happening in their house. In order to find out, what is happening, they decide to film their daily round. This movie is quite popular and there are four more follow-ups, which were not as successful as it was the first part. Feelings, experienced during the movie, are unique. The fear is so real that even when the movie has ended, you start to feel uncomfortable in your own house. This movie is simple, without any special effects or famous actors despite this it is really terrifying. Roger Ebert, the movie critic, says: “This movie brilliantly conveys two my favourite elements, which are silence and waiting. These elements intrigue much more than action concentrated on slaughter. For a long time there is no action in the movie, but you will not be bored. It is a Japanese version of a movie “The Grudge”, which was remaked by Americans. Why did we choose a Japanese version? The answer is simple – Japanese are professionals in horror movies. Although the American version is scary, this version is much more superior. It is a story about a cursed house, which is preserved by families. These families suffered from tragic deaths and ghosts. A story about six characters, which faced evil and tried to fight against it. Incredibly dark and scary story, which will dispel all romantic feelings at the Halloween night. It is a terrifying and professional movie, which will fit for those, who want to spend a horrific evening. Romantic horror movie? Sounds silly, but Thom Alfredson, the Swedish director, tries to convince people that romantic and horror genres can be tunable by presenting a movie called “Let the Right One In”, which was a successful work. The move is about a twelve year old boy Oscar, who is an alien. One day he meets Elly , a strange, dark-haired and incredibly strong girl. At the moment, when he meets Elly, Oscar has doubts about her, who she really is. Strange murders in his neighbourhood make him doubt more and more. „Let the Right One In“ is different and exciting movie, in which you can see not even horror but also feelings. It is a scary movie about a human story. Halloween will be right here so it is about time to scoop pumpkins and hang webs on the ceiling. We hope that this Top 10 will help you to decide what do to – leave at home or feel the Halloween spirit. We also hope that this creepy horror movies’ collection will make this Halloween scary and memorable!